Sony NP-FS21 is the next step up from Sony NP-FS11. FS21 lasts twice longer in camcorders than FS11. It does not, however, fit DSC cameras that use FS11. FS21 is designed to be twice thicker, and thus does not fir camera compartments. Camcorders are designed to attach the battery on a side, and thus FS21 fits perfectly. 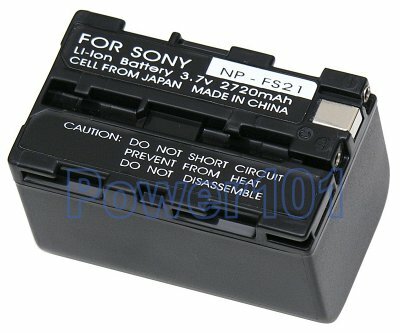 This battery is compatible with the following Sony camcorders: Sony DCR-PC1, DCR-PC2, DCR-PC3, DCR-PC4, and DCR-PC5. If you have a different camcorder - please check our camcoder battey finder to find the battery you need. 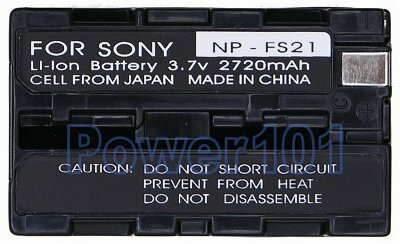 These batteries can be charged by any standard chargers compatible with FS11 or FS21 batteries. Such as the charger that came with your camera/camcorder.